(New York, NY) – Having completed a triumphant headline run on this summer’s Van’s Warped Tour, Chiodos have entered the recording studio this week to begin work on their forthcoming new album. The band have chosen producer David Bottrill (Tool, Muse, Stone Sour) to helm the new record which will be tracked at Dreamland Studio in Woodstock, NY. 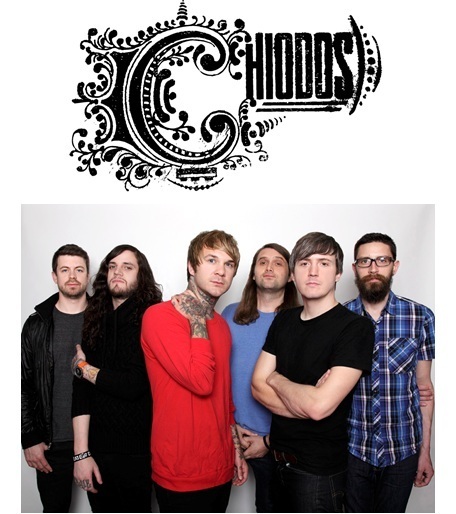 The new Chiodos album will be released in 2014 through a newly created, band label imprint via Razor & Tie. The new album will feature a re-solidified band line-up comprised of founding members,Bradley Bell (Keyboard / Vocals), Pat Mcmanaman (Guitar), Derrick Frost (Drums), and Matt Goddard (Bass) who reunited with charismatic, founding font man, Craig Owens(Vocals). The album will also serve as an introduction to the band’s newest member Thomas Erak (Guitar / Vocals) formerly from The Fall Of Troy. This entry was posted in Artist, Bassists, Drummer, Guitarists, Heavy metal, Internet Radio, Metal, Music, Rock, Rock N' Roll, RockStar, Surrealist, Tattoos, Vocalist, Wornstar Clothing and tagged Bleach Bang, Bleach Bangs, Bleach Bangs Radio, Bradley Bell, Charlie Owens, Chiodos, Craig Owens, David Bottrill, Derrick Frost, Hard Rock, Heavy Metal, Matt Goddard, Metal, Muse, Music, Pat Mcmanaman, Randy Norris, Rock, Rock N' Roll, Rock Star, RockStar, Silverchair, Stone Sour, The Fall Of Troy, the Hellion, the Hellion Rocks, Thomas Erak, Tool, Vans Warped Tour. Bookmark the permalink.